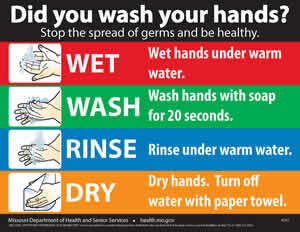 Handwashing is a simple thing and it's the best way to prevent infection and illness. Keeping hands clean prevents illness at home, at school, and at work. In healthcare settings, handwashing can prevent potentially fatal infections from spreading from patient to patient and from patient to healthcare worker and vice-versa. At home, handwashing can prevent infection and illness from spreading from family member to family member and, sometimes, throughout a community. Below are a few tips on keeping your hands clean and sanitized. Use soap and warm water, and scrub every nook and cranny you can, rubbing your hands together for at least 20 seconds. Get in between your fingers, cover the entire palm, and wash all the way down to the wrist on both sides. Some people say their ABCs and rinse when you get to Z. Try to avoid using your newly clean hands to touch the faucet or doorknob. Use a paper towel if available. What kind of problems can regular handwashing prevent? CDC's School Network for Absenteeism Prevention – Check out SNAP Toolkit for middle school curriculum on handwashing.